Every day, thousands of applications are submitted, received and evaluated by companies, schools and organizations all over the world. Nowadays the competition is global and has grown tighter. The reality is the percentage of applications that get accepted and processed is lower than the passing grade in a school subject. In 2013, prestigious Harvard University accepted only 5.8% of 35,023 applicants to Class 2017. In order to be considered, your application must stand out. For your application to get attention, there must be a differentiator which makes the recruiter believe you are the best candidate for their organization. This differentiator could be your cover letter. A great cover letter can make the difference of getting a job or not. Interested in learning how to write a great cover letter? Look no further, because you are on the right place. In this article, we’ll show you the best ways to write a cover letter that screams attention. To make it easier and more convenient for you, we have prepared a series of cover letter examples for your review. These cover letters have been designed to fit different situations and needs. Best of all, these are free cover letter samples! 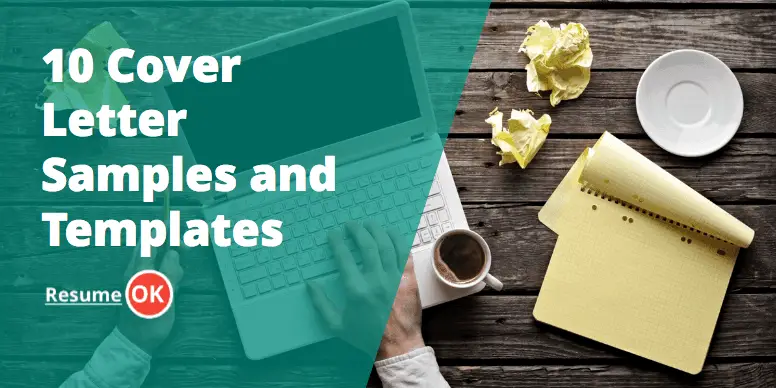 Before you check out the cover letter templates, please take the time to go over our primer on the standard cover letter template. 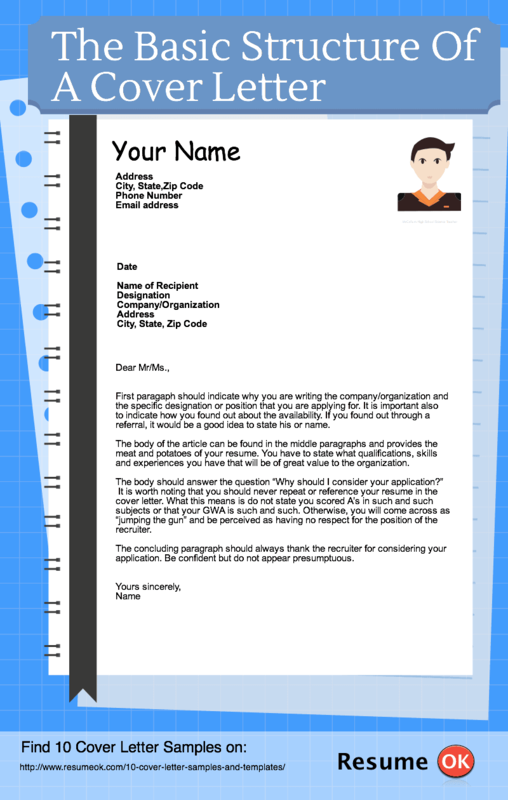 It will give you a good idea on the basic structure of a simple cover letter. From there, you can use the pointers to customize any of the attached examples. What is the purpose of the cover letter? What are the elements of an effective cover letter? Here’s the text of the infographic above. First paragraph should indicate why you are writing the company/organization and the specific designation or position that you are applying for. It is important also to indicate how you found out about the availability. If you found out through a referral, it would be a good idea to state his or name. The body can be found in the middle paragraphs and provides the meat and potatoes of your resume. You have to state what qualifications, skills and experiences you have that will be of great value to the organization. The body should answer the question “Why should I consider your application?” It is worth noting that you should never repeat or reference your resume in the cover letter. What this means is do not state you scored A’s in such and such subjects or that your GWA is such and such. Otherwise, you will come across as “jumping the gun” and be perceived as having no respect for the position of the recruiter. The concluding paragraph should always thank the recruiter for considering your application. Be confident but do not appear presumptuous. Ready to read the 10 more cover letter samples we have prepared for you? Use the links below to choose the template you need, or continue to read more about cover letters. A cover letter is an introduction to your resume. It tells the recruiter why he should look into your application and review its attachments. Thus, it is very important that your cover letter creates an indelible first impression. A truism in this competitive world is that your resume will end up in the trash can if it does not have a cover letter. Recruiters perceive the absence of a cover letter as lacking professionalism. Growing up, we were taught to work hard and study well in school. Students should get good grades; accumulate honors and achievements because the report card is our passport to a prosperous career. But over time, the qualifying criteria of companies and schools have undergone changes. Yes, your grades still matter; a candidate with higher academic scores will be a step ahead of another candidate with lower academic scores. However, companies and schools are no longer just looking at your General Weighted Average, honors, certifications, and recommendations. Recruiters want to see if you are a perfect fit for their organization. There is a growing trend among organizations to build its foundation on the merits of its culture. Case in point is Zappos, a billion dollar online retailer. It’s Founder and CEO, Tony Hsieh hires people not on the basis of their academic accomplishments or whether they have heard of the company or not. Hsieh will focus on the behavioral profile of the candidate. If he believes you will fit into the Zappos culture, you will be hired. Organizations have their own criteria for determining right-fit candidates. While some of these can be inferred from your extra-curricular activities and the preliminary interview, you will not be given the opportunity unless you impress them from the get-go. Recruiters will use your simple cover letter to assess whether you are made of the right stuff for their organization. The purpose of the cover letter is to get you noticed; make your application stand out. Recruiters will take the time to go through every application that lands on their desk. The first line of communication is the cover letter. If it does not have the component parts the recruiter is looking for, it will be discarded or set aside for secondary consideration at best. Here’s a different way of understanding the value of a good cover letter: Your cover letter carries more weight to recruiters than your actual resume! Yes, you read that right. It is a sales tool to get your resume noticed. When you are composing your cover letter, be mindful of whom you are writing it to. It helps to do some research on the company or school and get an idea of their culture and values. Finally, keep your content short, concise and to the point. Ideally, your cover letter should only be a page long. When you are trying to make a lasting first impression, you should take whatever measures are necessary to avoid grammatical errors and typos. Nothing turns off recruiters more than reading a cover letter that is punctuated with poor grammar and incorrectly spelled words. Given the thousands of other applications, chances are that once a recruiter encounters a typo, your application will end up as a three-point shot attempt at the trash bin. Human nature dictates that we always want to present ourselves bigger than who we really are. This is the normal reaction to competition. In sports, they refer to this as “gamesmanship”; the purpose of which is to gain a psychological advantage over another. But recruiters are wired differently. You will not have a psychological advantage over them. There are limits to how far you can stretch the truth and a recruiter will find out the exact boundaries because due diligence is part of the job. A recruiter will check up on the information you indicated in the cover letter by making phone calls, doing Internet research and visiting social media networks. When applying, there are no such things as “white lies” and “gray areas”. For recruiters, everything is in black and white.